Kuay pie tee - a delicious dish, but service here totally failed. At other restaurants, the crispy, deep-fried "top hats" are presented separately from the poached turnip shreds, and it is up to the diners to stuff the hats. I was away from the table for a few minutes, and this dish was served in my absence with the fillings already inside the shells. This meant that by the time I returned to the table, the sauce accompanying the filling had already soaked through the bottom of the shells and was leaking out... which made eating a little messy. In spite of this, these were absolutely delicious. The taste of shrimp broth stood out in the turnip shreds, and adding a little dab of sambal enhanced the overall flavor profile. 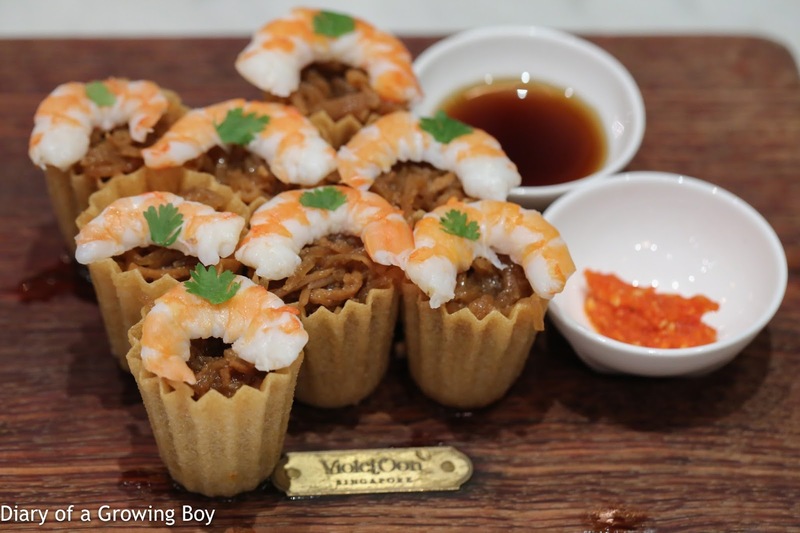 The only issue with eating kuay pie tee, as Hello Kitty found out, is that it has to be done in one bite. Dry laksa - I finally got to have this again, and I was very, very happy with this. Other than the fact that the thick rice vermicelli were a little overcooked - which I remember was also the case on my last visit - the flavors were all there. The "pesto" delivered galangal and turmeric on top of the chili and lemongrass. And those shredded laksa leaves! Just wonderful. 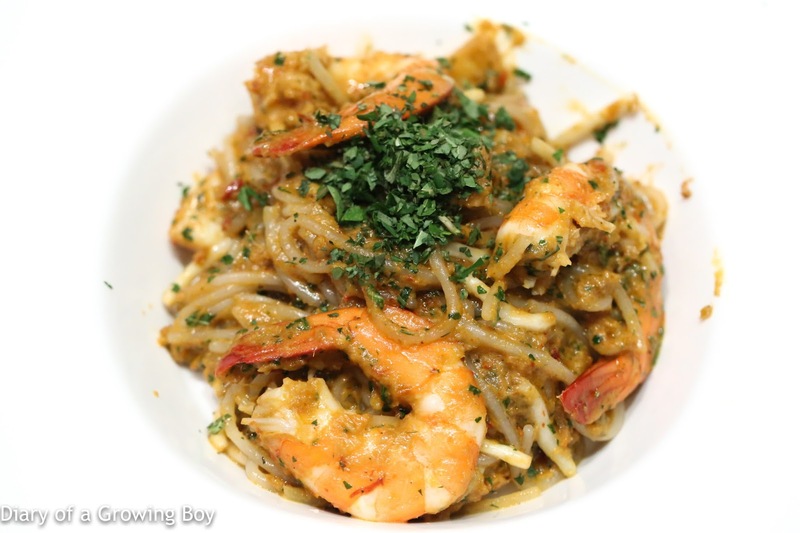 Everything I'd want in my bowl of laksa, without a whole big bowl of broth. I think Hello Kitty liked this, too... for the complexity of the flavors. 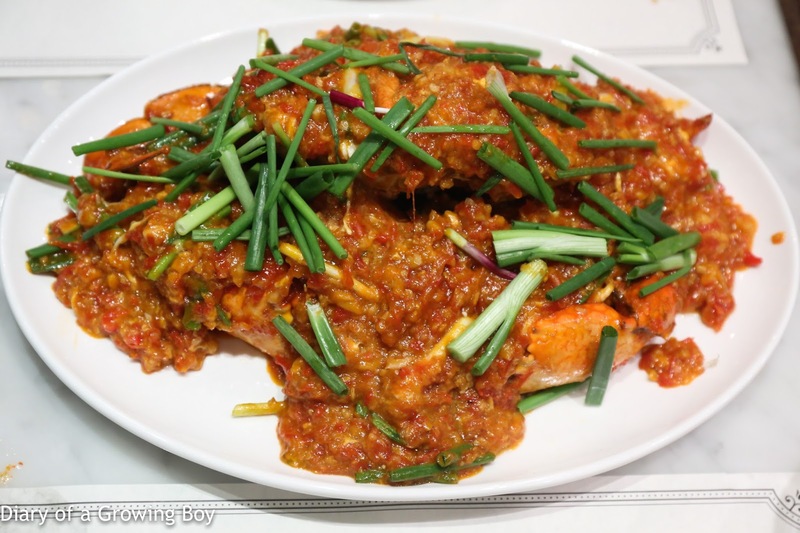 Chilli crab - well, I wanted to try something a little different, and I sure got what I wished for. But first, a word on pricing. 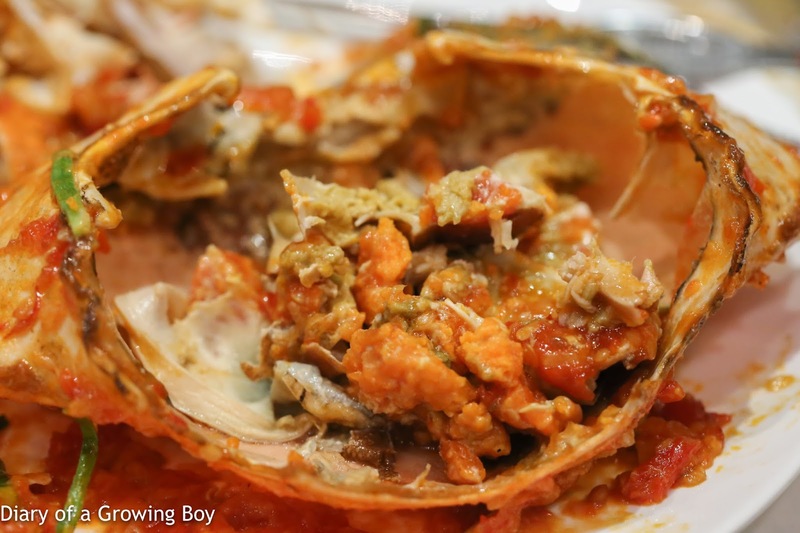 These crabs are sold according to the "market price" (hence the Cantonese expression "海鮮價") everywhere, and not being a frequent visitor to seafood restaurants in Singapore, I was no longer familiar with what falls within the norm of that market price. So when I was informed that the price was SGD 13 per 100g of crab, for a moment I experienced a little sticker shock... A quick search online got a couple of hits regarding pricing at other places, and confirmed that there was indeed a significant premium here. Given that the crab weighed close to 1kg, this ain't gonna be cheap. But I figured that since I came for a different take on the chili crab, I wasn't gonna back down. That would turn out to be the right (but painful) call. 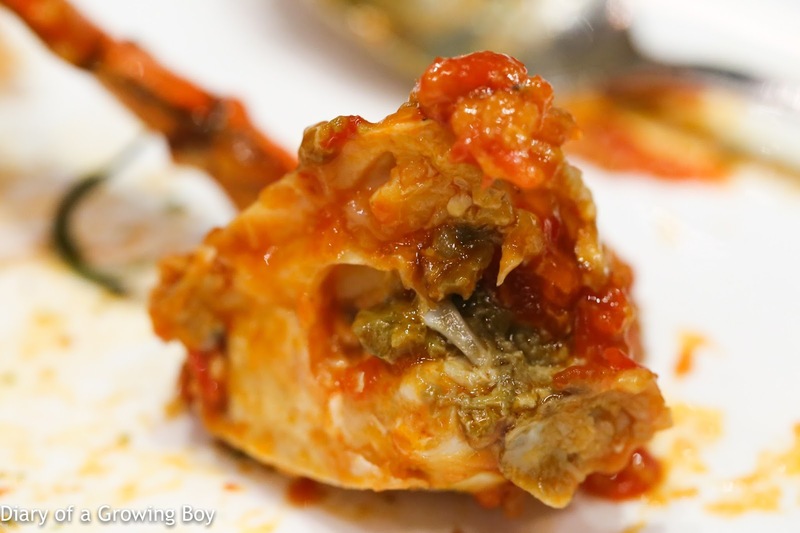 There seems to be a good amount of tomalley in this crab, judging from this segment of the body. 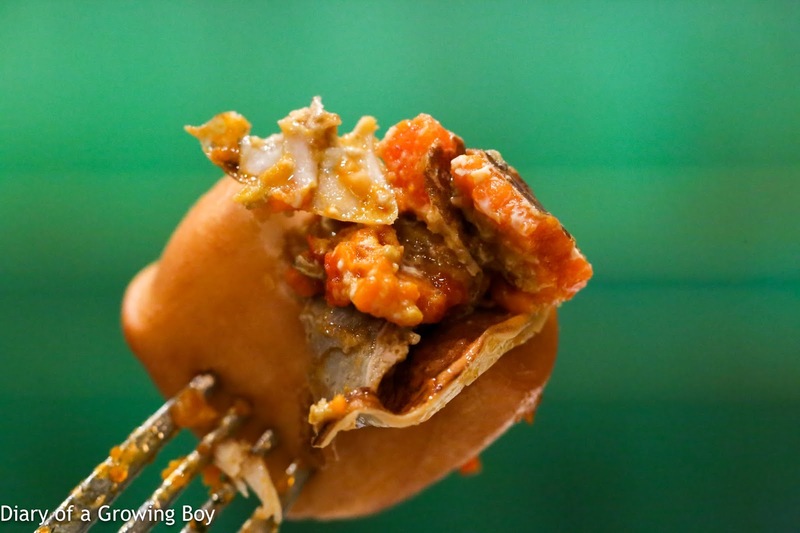 Mantou - the fried buns are de rigeur when ordering the chili crab. 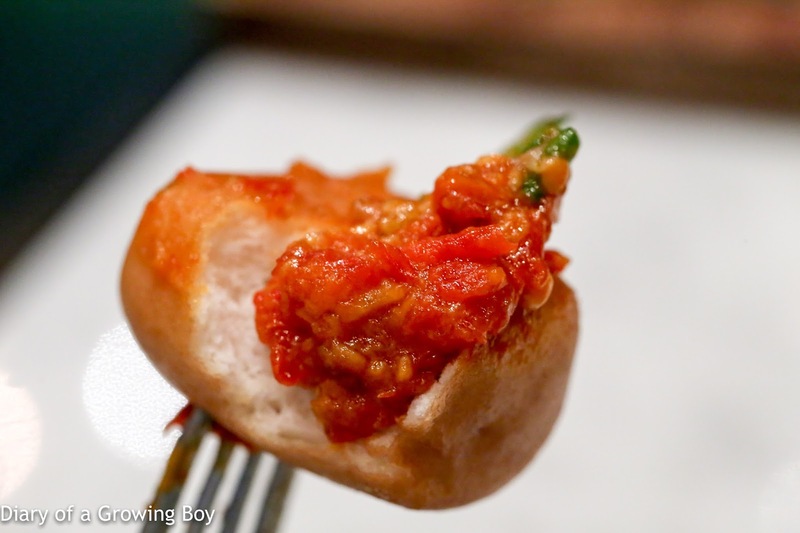 The chili sauce smothering the crab was very, very delicious, and naturally I dipped the mantou into the plate. Unlike other commercial versions popular in this town, this one was significantly less sweet, and also showed very little evidence of eggs. Just lots of garlic and chili. Lots of tomalley in the shell. Hooray!!! Now it was time to carefully place the tomalley on the mantou and chomp! For the first time in quite a while, Hello Kitty finished her food long before I did. Unlike me, she handles the heat of chilis with ease, and simply chomped down on her half of the crab. In fact, she inhaled three of those mantous without me even noticing! Meanwhile, this weakling was suffering as his tongue burned for the better part of an hour, all while trying to stop anything from dripping down from his runny nose into his food. Ice tea and lots of water helped a little.